I Get It. Investing is Hard. As I continue to get smarter in my investing career, there is one thing that keeps jumping out at me. I see it everywhere: the conferences I attend, the podcasts I listen to, the people I meet with, the books I read, and so on. What is this one thing? The stock market might seem like the easy route, but its volatility can devastate your portfolio. Here it is: people are questioning if it’s worth investing in the stock market. I thought for many years that I was one of the few who had decided it was no longer for me. That is not the case anymore. I’m certainly not alone. The stock market is a horrible way to invest. Okay, there, I said it! I feel like a burden has been lifted off my shoulders. I know I should never say such a thing. It goes against what every financial advisor recommends, and for many investors, the stock market may be the only thing they’ve ever invested in. Now, I already know that’s not the case for you if you’re reading this newsletter. You are investing — or at least interested in investing — in non-traditional investments, and maybe your entire portfolio is comprised of them. Here’s the deal. Investing is hard. It is hard work to do the due diligence on each investment opportunity; it is hard to find the right people to invest with; it is hard to figure what the long-term potential is; it is hard to quantify the risk involved; it is hard sometimes just to find the investments that are even worth doing due diligence for! Smart investing is a lot of work. Most people don’t want to do all that work, so they take the “easy” and what is accepted to be the “normal” route: they invest in the stock market. I get it. I don’t blame them, but they’re missing out on a tremendous amount of wealth building for themselves and their future generations. I recently went to lunch with a friend of mine, who is also an investor with us, and we chatted about where to put his money. He said to me, “I have more to invest. I don’t want to put it into the stock market so what should I do? Should I put it in your fund?” We both felt it would be better for him to diversify since he already has a good amount of his portfolio in a few of our funds. So where should he put that money? This starts the process of having to find another investment and prepare for all the work that comes with it. That dilemma is exactly what has been on my mind for some time: how can we help our friends, family, and investors with some of these decisions and alleviate some of the work in finding other non-traditional investments? I feel like people are sometimes forced to default to the stock market because of how challenging it is to invest in something else. I don’t have answers for you now, but know that this is something that I — and my company — are thinking seriously about as we prepare for a new year. Maybe later this year we’ll have a brilliant idea for you. A few weeks ago, I went to Dallas for the Freedom Founders conference hosted by a former dentist, and now investor extraordinaire, David Phelps. (You might remember the podcast I recorded with David a couple months ago; check it out here). I hate calling it a conference because it was so much more. It consisted of dentists and doctors who were there to learn how to run their businesses and lives better. They have “Trusted Advisors,” which I have recently become, attend. Many of these Trusted Advisors deal in the non-traditional investment realm, like me. We had panel discussions where we would talk about various investing topics. One of the recurring themes was whether to stay in or get out of the stock market and how many people in the group have moved away from the stock market and instead toward non-traditional investments. 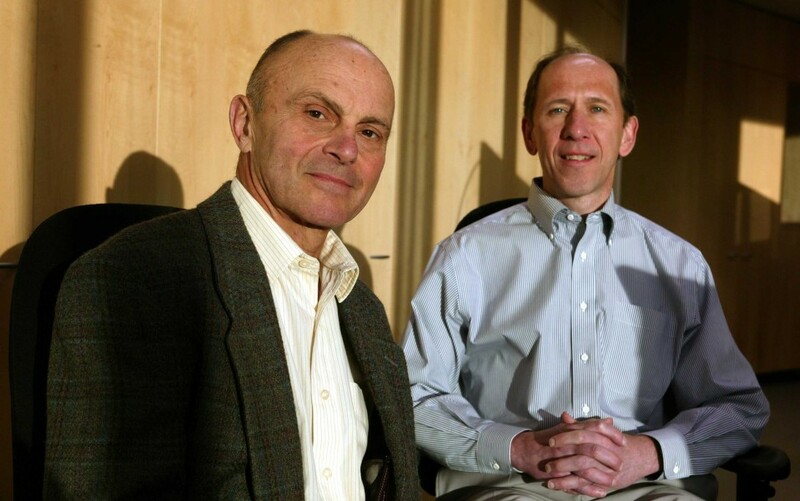 Nobel laureates Eugene Fama (left) and Kenneth French (right) found that index funds outperform actively managed funds 97% of the time. So why do we still think that we can “crack” the stock market code? The most interesting question was asked by the moderator: “Has anyone gone the other way?” Meaning, has anyone moved from non-traditional investing to the stock market? The answer was a resounding, “No!” Once people figure out how much better non-traditional investments are, they tend to move in that direction over time. Of course, we are exposed to the stock market on day one of our investing lives, so we tend to start there, but that doesn’t mean it’s worth staying there long-term. I am writing this on December 31st, 2018. 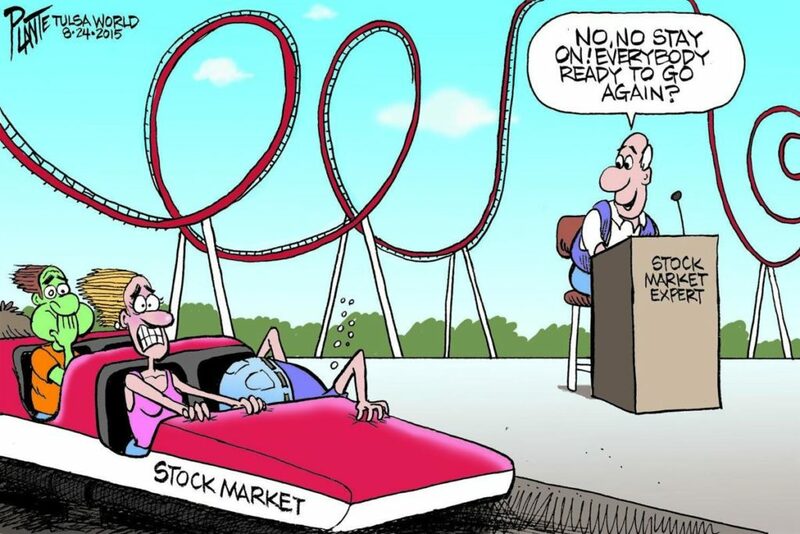 The stock market’s volatility is volatile, to say the least. Someone asked me at Christmas, “Did you have to talk some of your investors off the cliff this week?” I didn’t even know what was happening with the market until he asked me that because I don’t follow it. Yes, it is one ugly ending for the stock market in 2018. I try to teach people how that volatility can devastate your wealth over time. This dirty little secret is completely hidden below the surface if you don’t run the numbers. We teach this in our presentations, at conferences, and in our materials. 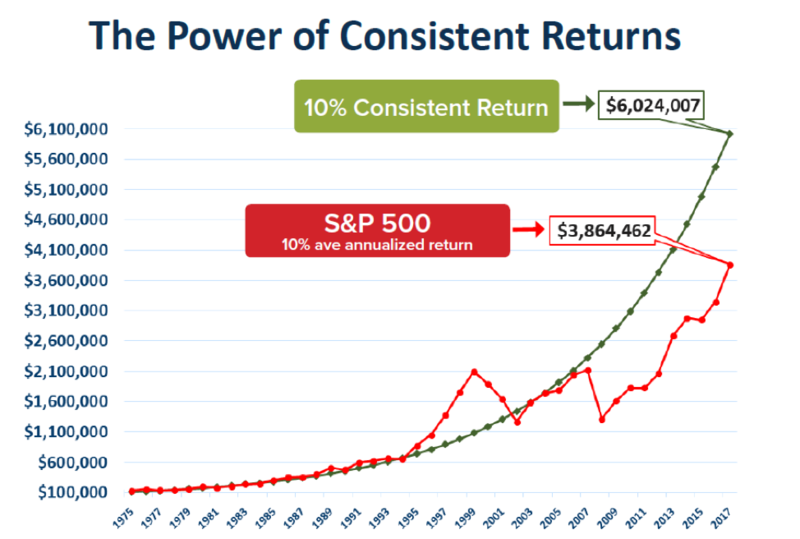 The difference between having a consistent return and a volatile one is tremendous. Over the last 43 years, the S&P 500 has produced a 10.09% average return but with lots of volatility. If you invested $100,000 in it 43 years ago, it would be worth $3.8 million today. However, if you were to invest that same $100,000 43 years ago and get a consistent 10% return, it would be worth $6.0 million. See how you can’t tell by the simple numbers what that volatility is doing to your wealth-building ability over time? Another thing I encounter with people is that they always want to tell you their wins, but somehow forget about their losses. I was reviewing some material on life insurance products the other day, and one of the products let you decide where to invest your money in the stock market, which was supposedly a “benefit” of this product. I told the woman helping me, “Good luck with that.” Then, of course, I couldn’t keep my mouth shut, and I had to talk about volatility and consistent returns. She went on to tell me how she had some great years investing in the stock market, earning 20% plus returns. Yes, I know there are some great years, but they don’t completely make up for the bad years. To me, the most off-putting thing about the stock market is that you are at the whim of the market. No one outperforms it in the long run. Not even the professionals. 97% of the time an index fund will outperform a similar actively managed fund. Now, what does that tell you? That statistic has been common knowledge for around 50 years, and yet people still put their money in mutual funds that are actively managed, hoping to outperform the market. We humans are a strange bunch! I wish I had all the answers to make it easy for you to invest, and I know non-traditional investments aren’t the cure-all for this dilemma. The wrong non-traditional investments can, of course, be volatile as well. Again, that is why investing can be, and usually is, hard work. Finding the right non-traditional investments will give you more consistency, less volatility, more control, less risk, and usually, better returns overall — and for sure a better opportunity to build your wealth in the long run.